Find relief for chronic dry eyes and why your eyes itch at different times of the year. 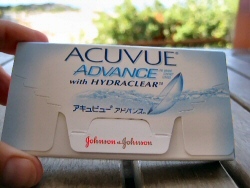 Most of the time, my Acuvue Advance contact lenses feel really comfortable, mainly as they have a high water content built into the lens which naturally lubricates the lens when it's in my eye. But sometimes, they feel really itchy and I start to think I have chronic dry eyes! Sometimes, it's at the end of the day and I know I've just had the lenses in for too long. But there are also certain times of year when my eyes just itch like crazy and feel oh so dry. Summer time is when I seem to get the most chronic dry eyes. Living in a warm country like Cyprus means my eyes have to cope with extremes of temperature and also high levels of humidity. ...actually this is partly true as some of the itchy feeling is caused by DUST! ...and it also feels like my eyes are producing far more tears than normal. This is just the body reacting to the difference in temperature and humidity levels and causes the eyes to produce more natural lubrication. Unfortunately, those tears contain salts and that's partly what causes the extreme itchiness. I normally wear my Acuvue Advance lenses for 10 to 14 days. But in summer, I make sure I change them every week. Instead of just popping the lenses in the case every night, I gently clean them by rubbing the lens lightly between my fingers before leaving them to soak. This removes any excess deposits from your tears on the lens. I sometimes alternate them with prescription sunglasses during the day to give my eyes a rest from the contact lenses. If I'm cycling in high temperatures or doing watersports (it's often easy to lose a lens when waterskiing, especially when you fall in! ), I often use a daily disposable lens, Acuvue Moist, which I can simply throw away at the end of the day. If my eyes get really itchy, I use eye drops to alleviate any scratchy feeling and if they are very bad, I leave the lenses out for a few days to give my eyes a complete rest.